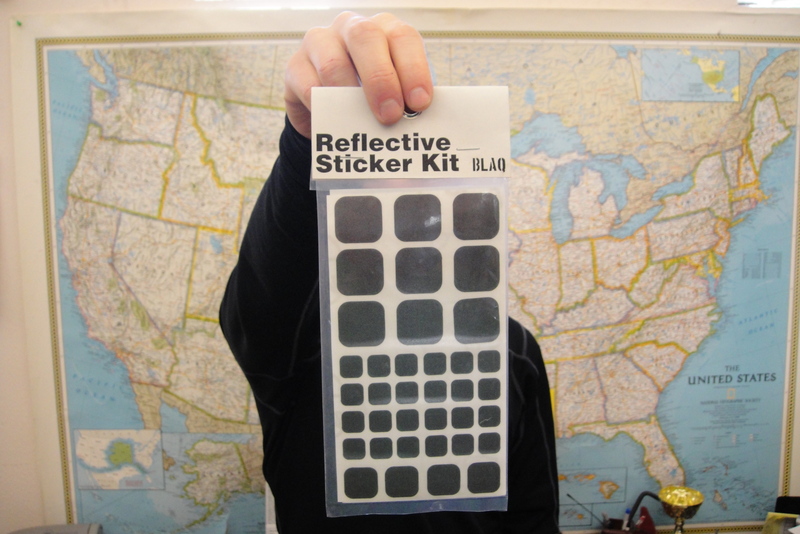 As with almost any product review, this one is not for every rider and certainly not every bike, but hear me out—reflective stickers, locally made reflective stickers from BLAQ, are worth your consideration. Now I know many of you wince at the thought of adhering anything to your beautiful carbon steed, and still others might dismiss the utility of reflective stickers all together. However, think back on the last time you were startled at night by the sudden apparition of a well reflector’d but otherwise invisible rider. Every bit of precaution helps. So, perhaps you’re asking, “Why a review?” All that reflective stickers need to do is reflect and stick, right? 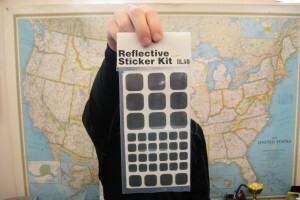 Well, let me tell you, BLAQ’s reflective stickers most certainly do. Now, every adhesive sticker has its limits and I would certainly recommend prepping any surface with rubbing alcohol. But, these stickers still stick, even under less than ideal conditions. They stuck to my filing cabinet, my computer, my shiny fork, my dirty chain stay, my stem with a shot-peened finish, my fenders, and even on top of layers of other deteriorating stickers! They did, however, fail to stick well to my bar wrap, saddle, and tires, which, I suppose, can be forgiven. As for their reflective properties, they certainly are as reflective as any road sign, jogging vest or…bicycle reflector. Maybe you are still asking why a reflective sticker that both reflects and sticks is news. Well, if the fact that they are made here in Portland isn’t enough to get you running out the door, maybe the fact that they come in BLACK will. Yup, aside from coming in colors like white, red and blue, the advanced R&D department at BLAQ figured out how to make reflectors both stealthy and highly visible at the same time! 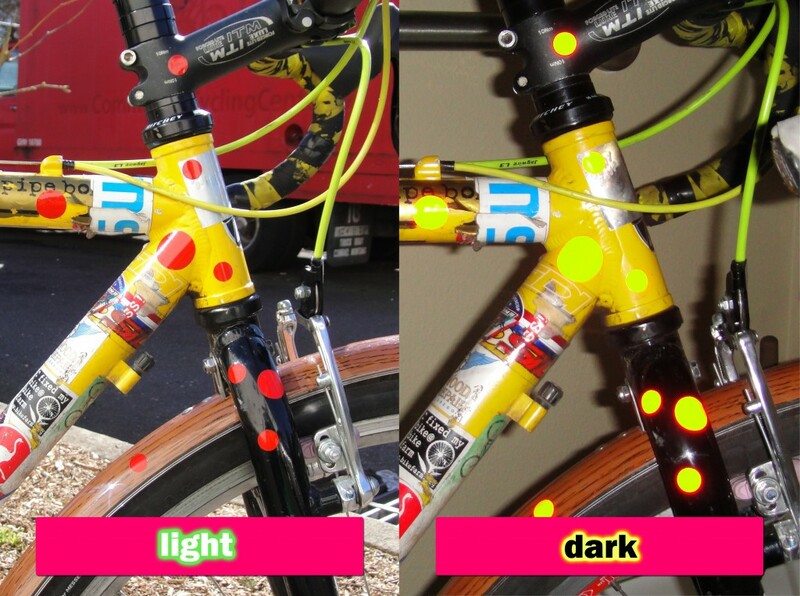 Whether you are simply hoping to increase your bike’s visibility without detracting from its immaculacy, or you are a shop-local Portlander looking to draw more attention to the “fun between your legs,” I would recommend procuring your own BLAQ Reflective Sticker Kit TODAY! ….Still not out the door? Well, maybe next time you find yourself at the Community Cycling Center, you just might want to check them out. Also, check out our other products from BLAQ. BLAQ is a new manufacturer in town that specializes in all sorts of bicycle related soft goods including bags, panniers, pedal straps, lock holsters, and even cargo bike canopies, among other things. They are located at 1100 SE Division.